Art is the wine barrel fermented and aged version of Arthur (1922-2005), our grandfather's youngest brother as well as the name of our rustic farmstead ale. In honor of Arthur, we mindfully blend his namesake beer from French oak wine barrels that have been aged and conditioned for between 1 and 3 years. This is the standard that reflects, redefines and guides the progressive vision for Hill Farmstead. Pours a vibrant, hazed golden with a fairly fluffy, cloud white head. pretty nice head retention, tons of sticky lacing left behind after every delicious sip. Flavors of the above mentioned, plus some slightly under-ripe banana, grass, and a hint of oak. Carbonation level is just edgy enough and brings the flavors alive nicely. It is slightly aggressive in style, but im loving it overall. An oversized wineglass really does the appearance of this beer justice. Perfect slighly hazy golden color. Was extremely active in the bottle before pouring. The smell was pleasantly funky and tart...you can smell it the second it pours. The taste blew me away...zero flaws as far as I'm concerned. Everything good about Arthur with the added complexity and tartness from the wine barrels. Even has a bit of vanilla flavor in the aftertaste which was very nice. Less carbed than I was expecting and that's not a bad thing...almost creamy, which I didn't expect either but I really really enjoy. This may just be the best beer I've ever had. Wish I could drink this every day. Appearance - Pours a pale straw yellow that is slightly opaque, but you can vaguely see through it. It's golden hue resembles more a glass of Chardonnay than beer, but the narrow, dense, snow-white head gives it away. What the head lacks in height it more than makes up for in retention, as it never fully dissipates; even when it finally sinks, it coats nearly the entire surface with a thin film of foam.Bubbles of carbonation lackadaisically rise to the surface every now then, but they are sparse. Aroma - The aroma is a blend of fresh-cut grass, lemon peel, nectarines, subtle graininess, and finally a burst of white grapes at the end. It is altogether cohesive and summons and subtle tartness that ties everything together. The fruitiness of it makes it infinitely refreshing to smell, and the acidity coupled with the almost tropical-like fruit blend is nearly flawless in execution. The barrel is integrated seamlessly, with waves of oak, vanilla, and finally the wine itself washing over the other notes without overpowering them. Taste - After my first sip, I was surprised at how acidic Art actually is compared to what I perceived in the aroma; to be fair, in contrast to other beers it isn't overly acidic, but it came across more than I expected. After a few more tries to acclimate, it's easier to swallow. The grape-lemon zest combo is still king and why not, since it is so good? Lemongrass and the grains come next to light the load, before finally the fruits emerge again to carry this to the finish. The tartness kicks the flavors up to a whole new level. The wine is a bit more present here and it contributes a slight booziness that oozes into the other flavors to give them that barrel-kissed feeling. The vanilla falls away here, leaving the oak to drive home the barrel notes. Mouthfeel - The mouthfeel is probably the only thing I can fault Art on, in my opinion. I was expecting more carbonation based on the style, but it falls pretty low on spectrum, and a bit more would've made this even better. Otherwise, this is very nice. It is light on the palate and is just dry enough to make it super refreshing. Closing Arguments - As my first foray into Hill Farmstead's barrel-aged program, and really, to the brewery itself (I've never really tried many of their beers even though they are always on my radar ever since I had Ephraim way back in early 2011), I didn't know what to expect with Art. Happily, I can easily proclaim this is near the top, if not the top, of my saison list. It is flawless in almost every way besides the carbonation, and I could drink this endlessly - especially in the summer heat. Batch 4 (thanks Mike!) served in a HF tulip. Pours a burnished orange hue with a frothy, off-white head that dissipates into a bubbly band around the edges. Nose expresses vinous notes, a hint of vanilla and a trace of apple cider vinegar. Taste consistent with nose; however, the flavor profile comes off a bit watered down. There's also the addition of lemon peel. Mouthfeel is light in body with a soft carbonation and a mild acidity. Overall, quite tasty but not sure it lives up to the hype. World class saison with wonderful carb. Tartness of a green apple with a crisp dryness that really invites additional drinks. The smell is funky, Bretty, and lightly fruity. Impeccable balance and crispness. Fantastic beer. On-tap at 2012 Hill Farmstead Harvest Fest. Pours a cloudy light yellow with a foamy white head. Nice lacing. Aroma is slight sour white grapes with light vinegar. Upfront taste is moderately sour, vinegar, unripe grapes. Sourness follows through to the finish. Fruity esters linger while the sourness gradually diminishes. Moderate/lighter body with high carbonation that fits the beer well. Overall very enjoyable. Reminds me a bit of St. Lamvinus, but with a different style grape. T: same as nose plus french oak. Tart with a hint of sweetness in the finish. Beautiful, almost opaque straw color. Aroma is white wine, oak barrel, warming alcohol, various stone fruit aromas. The taste follows with oaky, dry white wine. Plums and apricots and a slight alcohol warmth. Mouthfeel is perfect for the style, on the thinner side with a good level of carbonation. Overall, another great beer from HF. Expertly blended and look forward to saving my other bottle for a while! Latest rating of batch 3, which I enjoyed more so than 2 (which I also loved). The barrel flavor and acidity balance on this is just an unparalleled treat. Soft mouthfeel, bright, refreshing, with a nice tinge of tart on the finish. "Art is the barrel aged version of Arthur, our traditional farmhouse saison. Eventually, all releases of Arthur will be equal to the current release of Art... and Art will be aged for 12 months or more and released as a single barrel reserve." Big thanks to Barry for the extra. Poured into a snifter. A: Pours the color of apple cider, a light yellow gold with an impressive and mountainous four finger dense and frothy white cap that takes five minutes to recede to a smaller one finger version of itself that lingers for most of the session. The soapy lacing clings to the glass in thick clumps, curtains, and sheets. Perfect clarity. Amazing looking beer. S: Ripe golden apples with a restrained musty wet leather Brettanomyces profile. Lightly spicy (peppery), with a touch of sulfur and mineral and a little oak. I detect some lemon and a low level of sourness. Quite complex. T: Prominent notes of ripe Granny Smith apples accompany lesser traces of lemon and orange. Oak is well integrated, and spices maintain a peppery presence, adding complexity without dominating. Nice oak notes. Brett is well integrated, imparting lower levels of musty and leathery characteristics. Highly attenuated, with a soft malt profile and notes of earth. Bitterness is at a lower moderate level. Lightly tart with a low level of sourness. M: Upper light in body with a high level of carbonation. Mouthfeel is spritzy, effervescent, and very dry, with a light acidity. Overall: A very well crafted barrel aged Saison: complex, refreshing, and rewarding. Highly recommended. 750 mL bottle, poured into a tulip. Pours a filtered, hazed golden straw color with a dense, frothy white head that initially fills the glass. Abundant lacing coats the glass and the head has nice retention supported by a consistent stream of bubbles. Aroma is very dry, vinous and yeasty. Some residual sweetness with oak/vanilla, ripe grapes, and banana but earth and red wine dominate. Not much presence of spice or funk. Smooth, medium-thick body. Soft, fine carbonation with a dry, oaky finish. Docking the mouthfeel a little for the finish which is very tannic and oaky. Similar experience as Sean preceding me. Not as much wine as the aroma, more vanilla and woodsy oak. More brett funk comes through suppressing the fruity and yeasty sweetness of the aroma. Another well made, good but not great saison from HF. I enjoy this more than the base Art I had a few months ago, but the wine barrel (particularly oak flavors) are a little too strong. Reminiscent of McKenzie's Saison Vautour and honestly a little more consistent in composition. However Vautour is still the standard I look for in this style of wine barrel/wild saisons. Huge thanks to Chris (spycow) for sharing this gem. Served, appropriately, in a Hill Farmstead tulip. A - Big white foam with excellent retention settles to a thick chunky cap, and splotchy lace. Hazed dark apricot body with a few specks of suspended sediment. S - A delicious mixture of oak, bretty funk, tropical fruits, pale malt, spicy farmhouse yeast, and vinous notes. Is spice added to this? I get a mild saffron note. In any case it's delicious. T - Taste is a bit of a letdown, although it's still quite good. More buttery oak and pale stone fruit malt character. Some vinous notes in the finish. There's a faint oxidation/mineral note that I found a little odd, so I'm not sure this is something that needs to be aged any further, although that might help in cutting some of the oak. M - Smooth medium body, medium-low carbonation, and a lightly sticky finish. No obvious alcohol. D - This is really quite excellent. Tons of flavor for the lower ABV, pleasant texture, and a superb aroma. 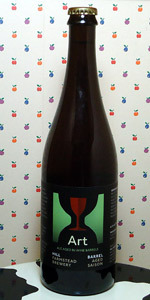 Another quality Hill Farmstead offering and one I'd love to have again.